Pretend for a moment that you’re a seal. You’re swimming along, minding your own business, when you hear a killer whale vocalizing nearby. Killer whales eat seals like you! So what do you do? You swim away as fast as you can, right? You’d be right, normally. 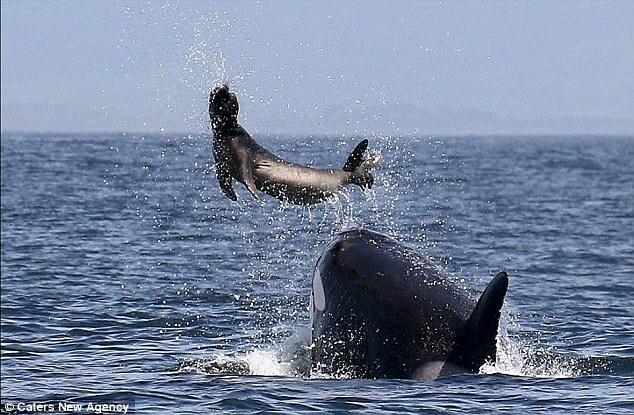 But there’s something more: killer whales don’t always eat seals. Some individual whales prefer to eat fish, while other individuals focus on eating mammals. If a seal hears a fish-eating whale, it doesn’t move – but if it hears a mammal-eating whale, it swims away. This only works for whales that live locally, in the same general place as the seal. If the seal hears a fish-eating whale that lives thousands of miles away (played through a loudspeaker by humans), they escape. This means that seals know the difference between the voices of individual whales in their area. This was the kind of science on display at the Gordon Research Predator/Prey Conference, which I attended about a week ago. The conference had some amazing science on display: fear of predation in parents causes cognitive impairment in the hatchlings of song sparrows, predation pressures in the ocean result in halo patterns in sea vegetation visible from space…my mind was blown every 30 seconds. I was there presenting my research on gyrfalcon predation in Alaska. People seemed genuinely interested in my work, and I was even able to present my project to one of my personal scientific heroes. The best part of presenting was the feedback. My wind results even piqued the interest of an alumnus of my lab, who showed me his prior work on wind and predation. With his advice, I was able to add to my results – turns out that ptarmigan not only adjust their presence to protect themselves from wind, but they also adjust to locations where wind speed is as high as possible in the air 50-100m above the ground. Higher wind speed is known to knock falcons with long tails off course, making it more likely for ptarmigan to survive an encounter. It was an amazing experience, one that I hope to repeat next year. This entry was posted in Water, Western Research Fellows, Western Resource Fellows, Wildlife, WRF 2017 and tagged Adam Eichenwald. Bookmark the permalink.